Fifth Harmony posed for Fashion Magazine’s Summer 2016 Issue. 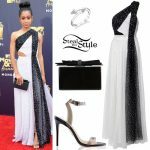 In one shot, Normani Kordei wore a BCBGMAXAZRIA Tati Ruffle Sleeve Dress ($248.00), a BaubleBar Chevron Cuff ($42.00 – set of 3) and Marion Ayonote Conqueror Gold Sandals (£750.00). 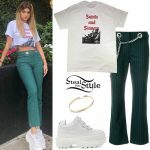 In another shot she is wearing a Kenzo Cross-Back Cut-Out Bodysuit ($360.00), Jonathan Simkhai Fluid Pleated Pants ($575.00), EF Collection Diamond Bar Wire Earrings ($625.00) and A.V. Max Double CZ Ear Cuff ($65.00). You can find similar pants for less at Nordstrom Rack ($69.97). Leigh-Anne Pinnock posted a picture yesterday wearing a Shadow Flowers with Letters Sweatshirt ($222.65) and Black Skinny Jeans ($184.25) both by Kenzo, with a pair of Chanel Suede Calfskin Sneakers (Not available online). You can find similar jeans for less at H&M ($19.99). Perrie Edwards posted a picture today wearing a Versace Logo Patched Sweatshirt ($876.00), a Kenzo White Pleated Skirt (Sold Out) and a pair of Topshop Gifted Tassel Tie Courts ($130.00). Leigh-Anne Pinnock posted a picture yesterday wearing a Pinstripe Cropped Wrap Jacket ($85.00) and Pinstripe Peg Leg Pants ($75.00) both by Topshop, a Missguided Sleeveless Knot-Front Crop Top ($20.40), the Kenzo ‘Flying Kenzo’ Clutch ($235.00), her Rolex Datejust II Steel/Yellow Gold Watch ($13,295.00) and a pair of Topshop Lola Patent Platform Sandals ($85.00). Kaya Scodelario appeared in Brazil today to promote her new movie “Maze Runner: The Scorch Trials” wearing the KENZO Love A-Line Dress ($592.33). Perrie Edwards posted a picture two days ago wearing a River Island Black Ribbed High Neck Top ($40.00), the Kenzo Pleated Skirt ($588.00) and a pair of River Island Black Snake Print Three Strap Sandals ($100.00). 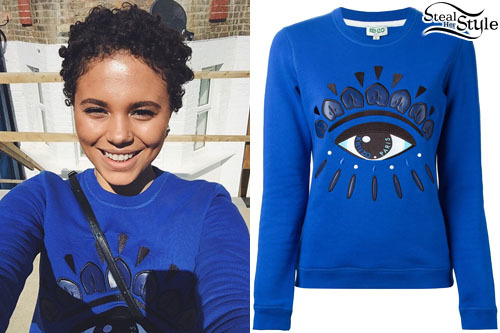 Jessica Plummer posted a picture a few days ago wearing a Kenzo Eye Sweatshirt ($198.00). 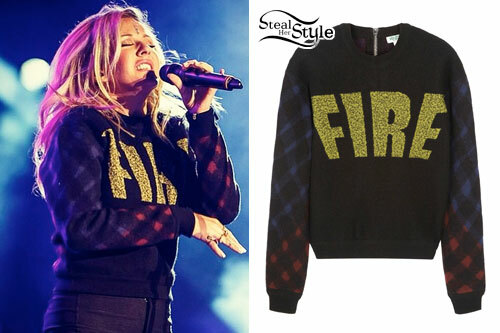 Ellie Goulding played a show wearing the KENZO Fire Wool-Blend Felt Sweater ($648.00) — also available at Net-A-Porter ($730.00), My Theresa ($670.00), Farfetch ($643.63 & up) and other boutiques. Katy Perry debuted her new music video for “This Is How We Do” earlier this week. 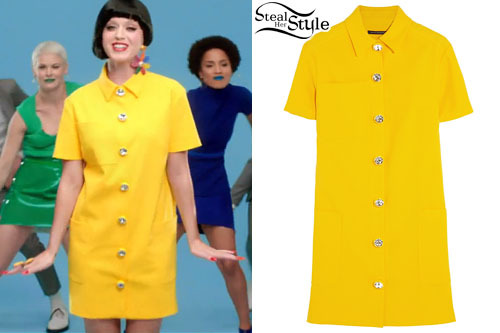 In the first shot from the video, she wears a Christopher Kane Embellished Wool Crepe Shirt Dress (sold out). In her second look from the “This Is How We Do” music video, Katy is wearing a Sacai Spring/Summer 2014 Striped Shirt (not available online), a Topshop Sports Waistband Pleat Mini Skirt ($35.00) and a pair of American Apparel Stripe Knee-High Socks ($10.00). 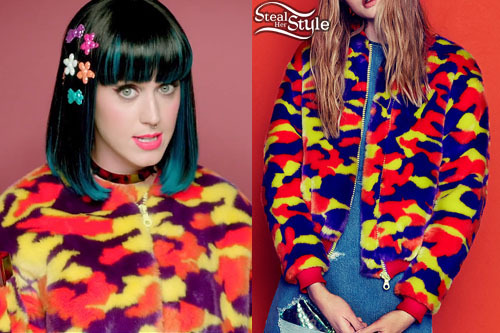 In the third shot from the music video, Katy Perry wore a Fur Bomber Jacket (not available online) from the House Of Holland Resort 2015 Collection. In her fourth look, Katy wore a Cotton Spandex Crop Tank ($28.00), Lambskin Leather Circle Skirt ($150.00) and a Nylon Tricot Scrunchie ($6.00), all from American Apparel with a Camila Walala Walala Bomber Jacket ($120.00). In the next look from the music video, Katy wore a Kenzo Cotton Poplin Pacific Waves Shirt (sold out) & a matching pair of Shorts (not available online). In the promotional shoot and next look from the music video, Katy Perry wears a Nasir Mazhar Quilted Skirt W/ Fur Pocket ($268.00, Gold) and Nasir Mazhar Cropped Quilted Jacket ($319.00, Gold) with a American Apparel Cotton Spandex Crop Tank ($28.00). She wore two single earrings by Delfina Delettrez: the Eye and Pearl Single Earring ($520.00) and a Diamond, Pearl & Gold Single Earring ($897.00). In the next shot from the “This Is How We Do” music video, Katy wore a Saint Laurent Cross-Over Red Lips Dress ($3,490.00). 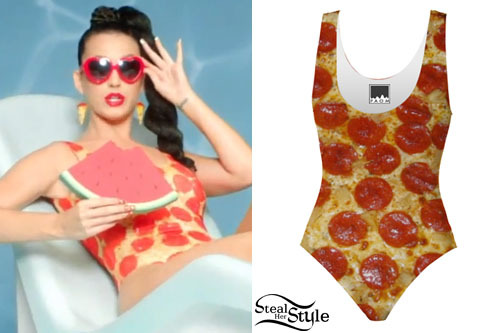 In her last look from the “This Is How We Do” music video, Katy wears a pepperoni pizza print swimsuit. You can get her look with a swimsuit from Print All Over Me ($98.00). Jessie J stopped by radio station Z100 in New York City to promote her new single “Bang Bang” a few days ago wearing a Kenzo Blue Wrapeffect Georgette Jumpsuit ($710.00, sold out), a Celine Black and White Canvas Large Phantom Tote Bag ($1,200.00, sold out), and a pair of Gucci Ursula Sandals ($850.00) in Raspberry. Get the look for less with a jumpsuit from Boohoo ($24.00), tote bag from Macy’s ($51.99) or Dillard’s ($66.50), and sandals from DSW ($69.95).